What do you do when you notice resistance coming up? Do you sit and say a bunch of positive affirmations? Pray? Journal? I had this image of being in lotus position trying really hard to think positive thoughts wishing my resistance away. Maybe if I repeat this affirmation over and over again multiple times things will change, my resistance will magically disappear. And we might do that, but still it lingers underneath the current of our energy. Positive affirmations are great, and they do work, but it is sometimes a bandaid solution that does not move us beyond our resistance. Prayers are great too. You all know how much I believe in divine intervention and yet here is the thing. Those are all support wings of creating shifts but if we really want to get beyond resistance we have to get to the root of why it is there in the first place. Sometimes resistance is there as an opportunity for us to clear about what we want, to check in on if we are headed down the right path, if we are alignment, so often the best thing to do with resistance is to be with it. Really be with it and ask why are you here. I waited and I listened. And then a memory came up. Years ago, I was on a visit to an Arabian farm with my mother. She was writing an article about this couple who bred Arabians and bloodlines all the way from Israel and Egypt where the bloodlines were the purest. I remember being in awe in their arena watching one of their young horses trot around. A woman was there working and she told me she went to Olds College for their breeding program. I was 13 years old and I knew in that moment I needed to go to that college and be a horse breeder. I lit up.I could feel it in my bones. And 6 years later, I in fact did get into Olds College. 1 of 10 students in the only breeding program in Canada. Fast forward 3 years after that and I found myself working at this very same breeding farm as their head barn manager. It wasn’t roses, far from it. The people ended up to be really not wonderful people, the horses were mistreated, I was mistreated, working 6 days a week, hardly being paid anything. I remember one night before heading to work I looked up to the sky and prayed for a break. I needed some time off. I was exhausted and I was unhappy and slightly traumatized at where I was working. The next day I went to work, one of my tasks was to put ointment on their prized stallion who they kept in a stall 24/7 because they didn’t want him getting hurt out in the field. Well he ended up getting hurt in his stall. As I was applying ointment to his leg, he kicked out, because it stung and I was standing in a really not great place and I got kicked in the leg. And as I flew across the stall I thought to myself I hope it’s broken. It wasn’t but I got a hematoma and lost feeling in my leg and had to be driven to emergency. I was on crutches for a week. The point to the story that I landed on tonight was underneath the resistance for me was anger and a bit of something else. 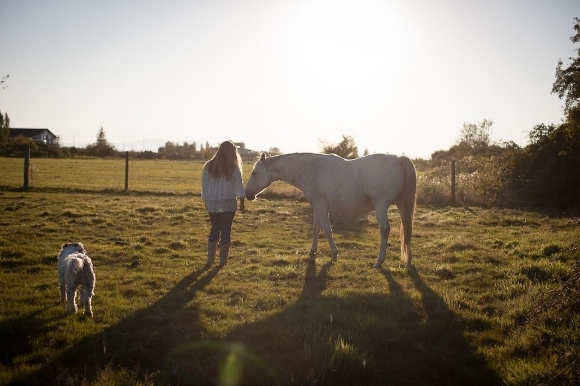 That time at that farm – that had begun my journey to be a horse breeder was heartbreaking for me, my ideal of what this career was meant to be about, the joy I had about being back at the farm that started it in the first place – wasa really terrible experience for me on multiple levels. I can look back at that now and know it lead me here to this path with horses but going through it, I was really angry. Because why would the universe bring me to a place that would be that horrible? Often what is underneath the resistance is an experience we once had in our youth, in our young adulthood that was traumatic for us. And sometimes we don’t deal with the emotions of it, so it lingers. And each time we brave a new path that may look similar to the one we are on, we get triggered. Resistance is often an opportunity for us to look into the past, heal our old wounds so we can meet the present path with optimism and embracing what is pulling us forward. Sometimes when we are in the moment of something, we can’t process it all. Where is it connected to? And then I wait to see what comes up, and then I write about it, journal about it so I can release the emotions attached to it. Sometimes while doing so I can land on a nugget of wisdom that I meant to hold to empower my way forward. Maybe it is discernment and looking into a deeper level of what is around me. Maybe it is boundaries or self-care. As I get the nugget and piece of wisdom, the resistance loosens its hold on me. Because resistance isn’t negative or bad. Sometimes it is a journey of letting go what we need to settle into so we can continue. Sometimes we would rather skip over it, skim over it with positive mantras or just think positive thoughts and it will go away when what we are really being asked to do is go there. Pay attention to what resistance is pointing you towards, sit with it, ask it why it is here, what does it need? What does it have for you to see? What is it bringing up so it can be let go? Whose vision are you living?